Lottery tickets offer us the dream of escaping to a different life. Often I find myself wondering what it would be like if I didn’t have to work full time. I always imagine spending more time on my open source software projects, getting in better shape and doing some freelance consulting to pay the time. About ten years ago I got to see my parents make the transition from working full-time to retirement. It wasn’t an easy switch for them. There was some sadness, a lack of motivation and a lonliness as they lost the human contact the workplace gave them each day. For the past two months I’ve gotten to experience what it’s like not to work every day. I was laid off from my previous job with severance. While I money wasn’t tight, there wasn’t enough to jet set off to Europe or go on any big vacations other than the ones I already had planned for the summer. I was stressed out most of the time until I found myself a new job. After I accepted the job offer, I gave myself a big window until I had to start so that I could relax and enjoy my time off. This was the longest stretch of time I had booked off; it has been 14 years since I’ve had that much time to myself all at once. When I was working, I imagined all the web projects I could do if I didn’t have to go to work. The reality of the experience was quite different. Once you have the freedom to do anything you want with your day, sitting in front of the computer is the last thing you want to do. For the first few weeks I found myself irritated by 3pm every day. I quickly realized that it was the lack of structure; if I got myself out of the house the feeling went away. So time was spent walking around the city, going to the library and reading in coffee shops. The beautiful weather really helped. Why stay inside on a sunny day if you don’t have to? Part of it was a desire to be around real people, instead of the virtual people I usually associate with if I’m stuck on a computer. There was a definite priority shift. With the freedom to do anything I wanted with my day, it made so much more sense to focus on those long term, important but not urgent goals. Organizing things around the house. Getting a new family doctor. Renewing my passport. Getting new contacts. Removing clutter from my house and my life. I had to laugh one day when I found an old to-do list from 2006. There was stuff on that list that was important to my life and my well being that I was finally getting around to. I found it amazing how much clearer it was to process my task list and choose the most important tasks for the day. Because I felt no urgency in any of my tasks, I was able to make much better decisions about what was important vs what wasn’t even worth doing. I’m about to enter the workforce again, and I hope I can take some of the clairity I currently feel with me. I’ve been browing through my local photographers looking for family portrait photographers and wedding photographers. As someone who is very familiar with the web, I’m always struck at how poorly some people do their web portfolioes. Like anything, the most important thing about a photography site is how it ranks on google for location + keyword searches. I’m sure that ottawaportraitphotographers.com does quite well when it comes to new clients finding them via Google. I chose my wedding photographer because he uses a blog to display his pictures. The pictures are big enough that I can see the quality, there isn’t anything hiding the images, and enough pictures load all at once that I can get a good indication that I want to see more without having to click on each individual photo. Blogs also have the added feature where I actually can tell that the photos are recent work. With some sites only the hairstyles give any indication of when the photo was taken. There were a few Ottawa wedding photographers who use this approach of having both a blog and a flash-based gallery, and I have to say I was impressed with all of them. The blogs are photo galleries all on their own. None of them mix personal blog posts in with the photos. If you use a flash-based site for displaying your photos, it has to be FAST. Use something like SimpleViewer instead of coding it yourself. Another pet-peeve is when the pictures aren’t big enough to see the photo in detail. Thumbnails are great for overall navigation, but it’s very hard to tell photo quality when the picture takes up less than one fifth of my screen. One of the worst things I’ve seen is watermarks embedded in the image. We all understand that you don’t want other people to steal your livelyhood, but much like how digital rights management shouldn’t prevent people from watching a DVD, the embedded watermark in a photo shouldn’t prevent your potential customer from seeing how good your pictures are. I can’t appreciate a photo when the writing on top of them is too distracting. Of course, it’s even worse to have blurry photos in your portfolio. Thank you, but if I wanted an out-of-focus shot I could do it myself. I hope if there are any amateur or semi-pro photographers in the audience they can learn a few things about what customers are looking for. Another thing not provided. Recently I have been trading with ETX Capital and their spread betting service and I’ve found the platform to be quick and responsive. However, this is only the case in Firefox. As soon as I try and open and close trading charts and modify my positions on Chrome, I get a lot of issues. As you will know, you need speed and precision when trading forex on a spread betting platform and so if your browser can’t provide it, you better believe that I’ll move on and try elsewhere. Social media – what is it good for? My blog comments are a horrible nightmare of spam that I still have yet to wade through. WordPress has anannoying bug that when you click “Mark As Spam” it always returns you to the start. There’s been 20 pages of comments. It’s likely that most are spam. LinkedIn - resume and networking tools to keep in contact with ex-coworkers. The best way to find a job is often through people who know you. You get a job, they often get a referral bonus — win/win. Doing your own SEO – if you can promote yourself in an effective way, then you are bound to end up with more leads. One of the most effective ways that you can promote yourself or your online business is if you embrace search engine optimisation. SEO, as it is better known, is the process of making sure that Google promotes your results higher in the search engine results. You can achieve this by writing quality content and building something of worth for users. One of the things that an seo company will frequently recommend is to monitor your site speed and your inbound links. If you can make your site quick and you don’t try to ‘game’ the algorithms, you can promote your website, or even your CV, very highly in Google. Peter’s New Jobs - regional tech job searches in Ottawa and Toronto, worth the yearly subscription even if you have a job because it’s a great way to stay current with the job market and how companies are doing. Standout Jobs - Montreal startup that is focused on humanizing the job search process and giving companies a chance to sell themselves. Working With Rails - job listings based on people working with a common technology. Is it more important for a site to be useful or to be sticky? The worst obstacle of all is the system of upmodding and downmodding comments. Your search for news becomes derailed into a video game – anything which involves computers and scoring points ultimately becomes a video game – and as video games go, it isn’t a lot of fun. It sure as hell isn’t Tetris. Worse yet, it’s almost ubiquitous. If you’re highly vulnerable to distraction, this game will steal your time. We should all know that it’s an incompetent social networking strategy because it comes from Slashdot originally – a site which specializes in crashing innocent servers so that nerds have an excuse to swear at each other – but despite this horrible pedigree, it’s a very popular approach. Every site which uses this approach inevitably ends up hated by former users, so it’s kind of weird that the approach is so popular, but there’s an easy explanation. The ultimate reason, of course, is a mistaken belief – specifically, the idea that user numbers are a better metric for Web app success than usefulness. This implies that anything which generates more traffic is inherently better. But purely for the sake of argument, let’s abandon this 1997 mentality and ask ourselves how useful a site like Reddit or Hacker News can ever really be. When you build a system where you get points for the number of people who agree with you, you are building a popularity contest for ideas. However, your popularity contest for ideas will not be dominated by the people with the best ideas, but the people with the most time to spend on your web site. Votes appear to be free, like contribution is with Wikipedia, but in reality you have to register to vote, and you have to be there frequently for your votes to make much difference. So the votes aren’t reallyfree - they cost time. If you do the math, it’s actually quite obvious that if your popularity contest for ideas inherently, by its structure, favors people who waste their own time, then your contest will produce winners which are actually losers. The most popular ideas will not be the best ideas, since the people who have the best ideas, and the ability to recognize them, also have better things to do and better places to be. I use social networking sites as information gatekeepers, but when time invested is the greatest factor of success then the people who are most successful will be the ones who invest the most time. You have to ask yourself if those are the people whom you want to be shaping and seeding your thoughts and ideas. Popularity contests always reduce the discussion to the lowest common denominator between the participants. Is that what you want to limit yourself to? As the population gets larger, the bias drifts; del.icio.us/popular becomes less interesting to the original community members. Work out ways to let the system fragment in to different areas of attention. “Spam is attention theft” – that’s one of the reasons del.icio.us doesn’t have a top 10 links of all time – it’s an attractive nuisance. When you’ve figured out someone is spamming, don’t let them know – let them keep posting and just silently junk their stuff. Automatic tags lose a lot – doesn’t help the user really achieve their goals. That’s why the “add to del.icio.us” badges don’t let you suggest tags. Value in Delicious is in the “attention” – auto-tagging detracts from this. Measure behavior rather than claims. del.icio.us doesn’t have stars because why would you bookmark something that was no good? This way people bookmark things that they really care about rather than trying to tell the system things. It’s a tool. The community can grow elsewhere. No threading etc. “del.icio.us sux” is an awful experience I’d rather user’s didn’t have. The only way to make sense of this information glut is by having the appropriate filters in place. I decided to solve Giles’ problem with Hacker News / Reddit and create a Greasemonkey script that lets you maintain a personal ban list. Click on the “ban site” link beside any site you never want to see again on Hacker News or Reddit. You can edit your list of banned sites at any time. Your personal list of banned sites lives in your web browser and is shared between Reddit and Hacker News. Use it to remove the most popular sites so you can pay more attention to the long tail, or to cut out the domains you already read using RSS. It’s your web. Click here to install the script (you will need Greasemonkey and Firefox). jQuery lets you very concisely access any element on the page through the use of normal CSS selectors and custom selectors specific to jQuery. If you can access it with CSS or XPath then you can access it with jQuery. It gives you more options for selecting elements than CSS or XPath. The other thing I love about jQuery is that it has plugins you can grab and import into your Greasemonkey scripts.Check out this concise plugin that lets you call Firebug’s console.log from within a jQuery method chain. That’s a perfect example of how powerful jQuery is. The hardest part of using jQuery with Greasemonkey is importing it. There are several ways to include jQuery into a Greasemonkey script. I’m going to walk through three of them. I would love it if jQuery became an official component of Greasemonkey, and I think that would greatly increase the number of useful Greasemonkey scripts being created. 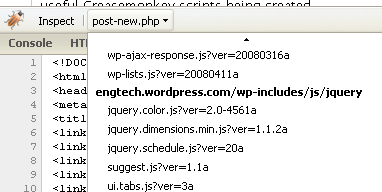 If the site already uses jQuery (friendfeed.com, wordpress admin) then you’re in luck: you don’t have to import it. You can find out if the site uses jQuery by running ‘alert($)‘ in the Firebug console or by looking at the imported scripts. If the site doesn’t already use jQuery (boo, hiss) then you can import jQuery from jquery.com. Joen Piedra has example code and a script showing how to do this. It’s a similar technique to the jQuerify bookmarklet that lets you add jQuery to any site in one click so that you can play around in the Firebug console. Here’s an example of one of my scripts where I use the embedded packed jQuery as well as an embedded image file. That script runs on Soundamus (a very cool site if you’re a Last.FM listener, check it out) and adds links to search for the artist/album on an different site.